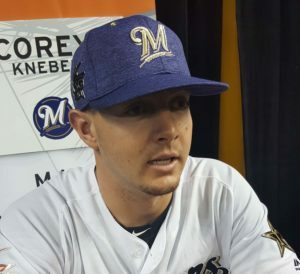 Milwaukee Brewers reliever Corey Knebel, after conferring with several specialists, has decided to undergo season-ending Tommy John surgery and hopefully return sometime next season. Knebel is scheduled to have the procedure done on Wednesday in Los Angeles with renown orthopedist Neal ElAttrache. Knebel said he inured the arm five years ago and it’s gotten worse over time. He said at the age of 27, it’s better to do it now than wait until later. The Brewers closer met with several doctors and they all recommended surgery. Knebel was told in 2014 while with the Rangers that he might need Tommy John surgery. He made it five years before finally needing the procedure. The Brewers are also dealing without reliever Jeremy Jeffress with shoulder fatigue. But he’s expected to pitch in his first game at Class AAA San Antonio in the next week or so and could rejoin the Brewers soon.